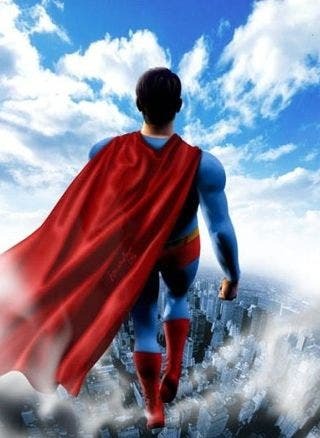 Some scientists say that there really is something Kryptonian among us, brought to Earth by impacting objects from outer space – only it's the noble gas, not a noble hero, because there's nothing more Kryptonian than Krypton itself. A new study shows that Earth's atmosphere may have been swept up from interplanetary gas clouds instead of coming from within the planet. Of course such statements are only a matter of timing – everything originally came from gas clouds, as interstellar material was pulled together to form first the sun and then an arrangement of orbiting planets. Many say that the atmosphere vented from within the Earth itself, slowly seeping out over time or violently released by bombardment from space. Dr Greg Holland and colleagues of the University of Manchester instead say that the air we breathe comes from clouds dragged down from the heavens after our Earth had formed. The key to the work is isotopes: nuclear variants of elements which have the same arrangement of protons and electrons, and thus the same chemical properties, but a different number of neutrons. The ratio between various isotopes in any sample acts as a signature of the source. The team retrieved samples from hundreds of meters below the surface of the Earth: these samples seeped up from the rocky core, and showed significantly different ratios than that of our atmosphere, as do samples from recovered meteorites. Instead the observed ratios could come from clouds of interplanetary gas swept up by our planet's gravity early in the Solar System's history. And it's not just Krypton (and Xenon, which was measured as well) – they're just the signs of wholesale atmospheric inflow from outer space. The work is not conclusive, but strongly suggests that at least some of our air came from off world. Sorry: we know you expected breathing alien air to be more exciting.